The Nutkin socks are done (pictures forthcoming), I’ve cast on for a Clapotis with some kind of mystery yarn from my stash that I am pretty sure is some kind of merino wool (because it’s amazingly soft and has a lovely halo), and I’m nearly done with the first front panel for my ribbed cardigan. And in the midst of all of that, I finally managed to get some decent pictures of these (sadly, these have been done for *months* now). 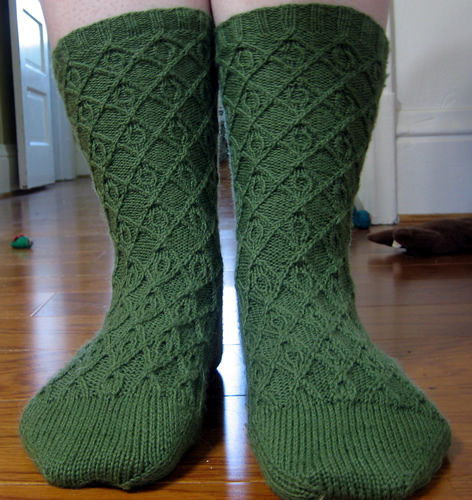 This pattern is now available in in the Summer 2009 edition of Knotions – Spindle Socks. Oh my, those are beautiful. I just might have to buy that pattern. Awesome job.